, an eminent Italian writer, was born at Venice, Dec. 11, 1712. 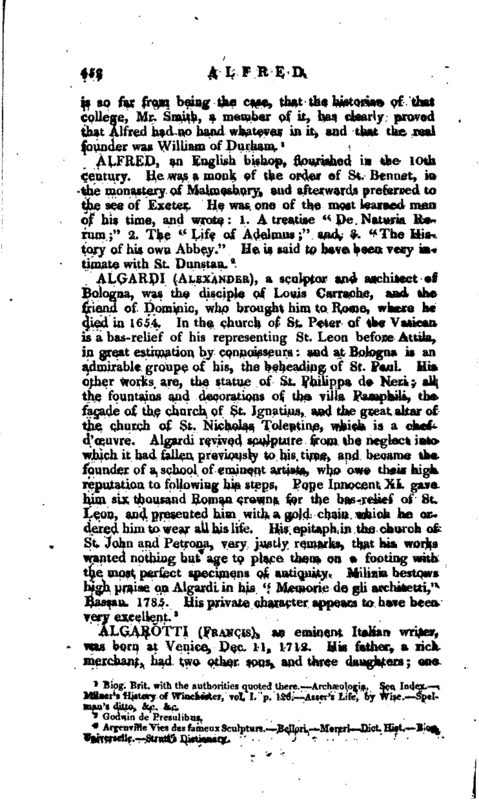 His father, a rich merchant, had two other sons, and three daughters; one | of the sons died an infant; the other, Bonomo Algarptti, who took the charge of the family on the father’s death, survived the subject of this article, and was his executor. 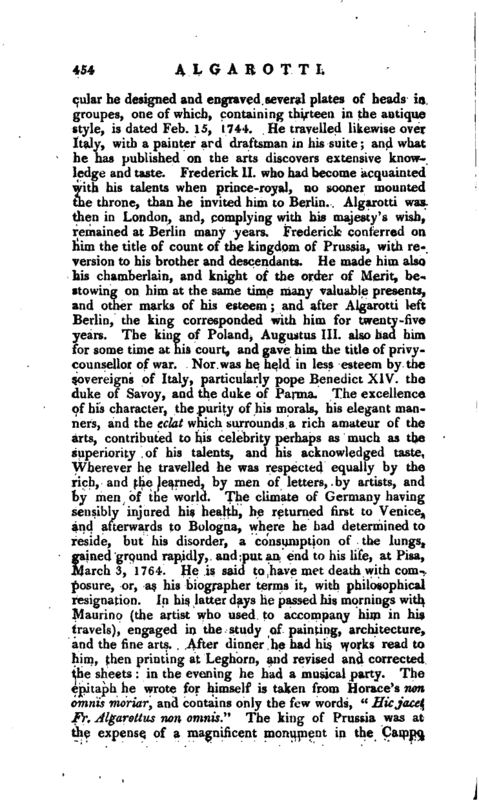 Francis studied first at Rome, then at Venice, and lastly at Bologna, under the two celebrated professors Eustace Manfredi and Francis Zanotti, who loved him for his sweetness of temper, and by whose instructions he made a very rapid progress in mathematics, geometry, astronomy, philosophy, and physics. He was particularly fond of this last study, and of anatomy. Nor was he less assiduous in, acquiring a perfect knowledge of ancient and modern languages. 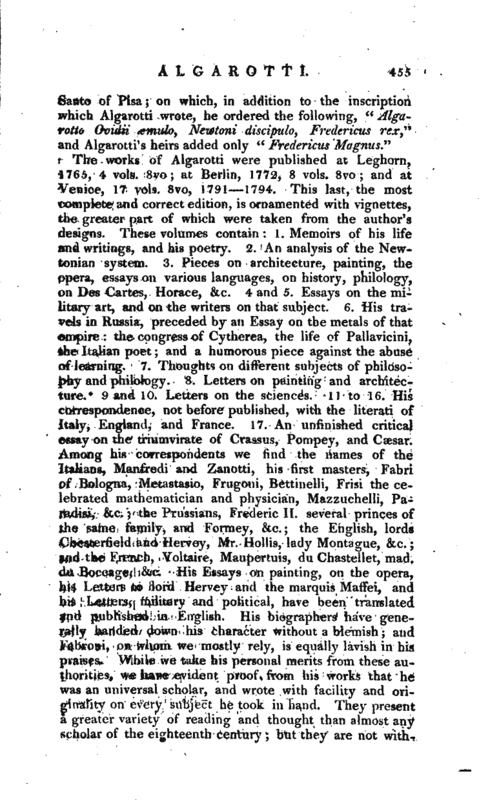 Before his first visit to France he became known to the learned world, by the many excellent papers he had printed in the Memoirs of the institute of Bologna; and in one of his rural retreats, in 1733, he wrote his “Newtonianismo per le Dame,” in which he endeavoured to familiarize Newton’s system to the ladies, as Fontenelle had done that of Des Cartes. He was now only in his twenty -first year, and this work, which was published in 1734, acquired him much reputation. It was almost immediately translated into French by Duperron de CastCra; and, although very incorrect, this was the only edition from which the French critics formed their opinion of its merits, and from which a translation was also made into German, but not into English, as the French biographer asserts. Our celebrated countrywoman, Mrs. Carter, used the original, in her translation, published in 1739, and revised in the press by Mr. (afterwards Dr.) Samuel Johnson,. It was entitled “Sir Isaac Newton’s philosophy explained, for the use of the ladies, in six dialognes on Light and Colours,” 2 vols, 12mo. 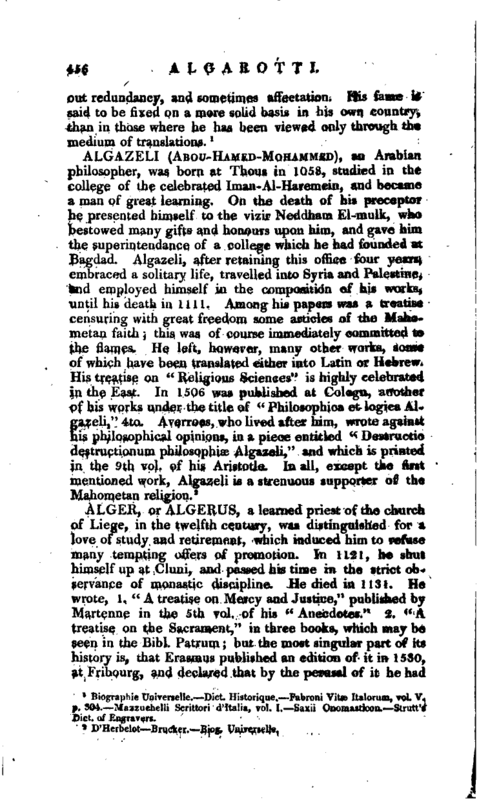 In his early years Algarotti had cultivated a poetical turn, and after some favourable attempts of the lyric kind, he wrote several poetical epistles on subjects of philosophy and science. These were collected, with others of Frugoni and Bettinelli, and published with some pretended letters of Virgil, in which a bold attack was made on the merits of Dante and Petrarch. 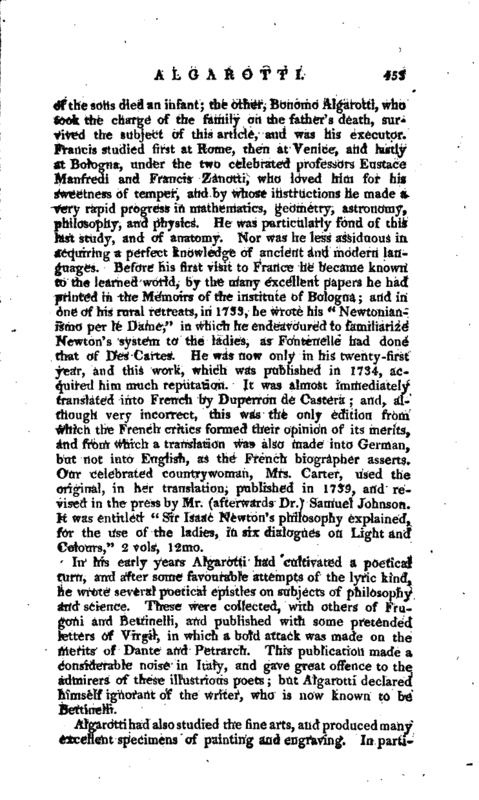 This publication made a considerable noise in Italy, and gave great offence to the admirers of these illustrious poets; but’Algarotti declared himself ignorant of the writer, who is now known, to be Bettinelli. Biographie Unirerselle.—Dict. Hist.orique.—Fabroni Vitæ Italorum, vol. V. p. 304.—Mazzucbelli Scrittori d’Italia, vol. I— Saxii Onomasticon.—Strutt’s Dict. of Engravers.